The Bhagavad Gita, also more simply known as Gita, is a sacred Hindu scripture. However its philosophies and values are intended to reach all people beyond religion or creed. It is at times referred to as the "manual for mankind" and has been highly praised by not only prominent Indians but also foreign nationals. It is revered for its literary value and philosophical thoughts. The Bhagavad Gita comprises exactly 700 verses, and is a part of the Mahabharata (an ancient Indian epic). It is a scripture with sublime thoughts and practical instructions on Yoga, Devotion, Vedanta and Action. The Bhagavad Gita has influenced many great thinkers over the years. Rig, Yajur, Saama, and Atharvana, the four Vedas are the treasure troves of knowledge. 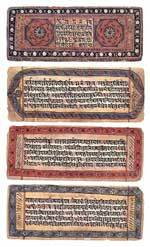 Each Veda is divided into two sections. The first portion is known as Karma Kanda and is primarily concerned with the performance of rituals and yagnas. The second portion is based on knowledge (Gyan) and is hence known as Gyan Kanda. These Gyana Kandas of the Vedas are known as Vedanta. The Bhagavad Gita embodies this Vedantic teaching and is regarded as the essence of all Vedantas. Bhagavat Gita is also known as Gitopanisad and is considered as one of the most important Upanisads in Vedic literature. The beauty of this timeless scripture is that its essential message is universal. The teachings of the Gita are applicable to every human being whatever religion or sect he belongs to. The everlasting values of the Gita are indeed for all of mankind. The Bhagavad Gita emphasizes that every human being is a complete, adequate self. Only when an individual attains the knowledge of the self, the sense of inadequacy will disappear from him. When one discovers oneself to be a full and complete being, all his conflicts and sorrows vanish leading to natural and effortless happiness; he becomes a spontaneous person and takes life as a sport. To appreciate the laws of the Gita it is necessary to possess a balanced and contemplative mind free from likes and dislikes which are the obstacles to the knowledge of the self. As such Karma Yoga is the essence of the teachings of Bhagavad Gita as a means of eliminating likes and dislikes. Karma Yoga is devotion to God expressed in the attitude of offering while performing an action and in the attitude of glad acceptance while receiving its results. Simply putting, according to Karma Yoga one should do his duties (karmas) without expecting any returns. This attitude of Karma Yoga neutralizes likes and dislikes and brings about a mind that is tranquil and open – a learning mind. Love and non-attachment, according to Gita, are the two virtues that one should follow to achieve self-renunciation.The effectiveness of the Gita teachings is evident from the declaration of Arjun, "My confusion is gone. I have no hesitation in doing what is to be done," after understanding Lord Krishna’s teachings. This is what each of us should be able to say after assimilating the teachings of the Gita. The Bhagavad Gita, though it is the essence of the Vedantas, has been interpolated in one of the great ancient Indian epics—the Mahabharat. The Mahabharat is the story of the descendents of King Bharat; it is the story of ancient India. After the death of King Pandu, his blind brother Dhritrashtra succeeded the throne. He brought up the five sons of Pandu, the Pandavas along with his 100 sons. The adharmic Duryodhana, Dhritrashtra’s eldest son, became jealous of the virtuous Pandavas and planned to get rid of them. Fortunately, the Pandavas and their mother Kunti escaped his plot and lived in the forest under the disguise of Brahmins. At the Swayamvara of King Draupad’s daughter Draupadi, Arjun, third prince of the Pandavas, succeeded in winning her hands. Duryodhana was one among the contestants, who had lost. On the advice of Bhishma, Dhritrashtra’s uncle, half of the kingdom was resentfully handed over to Pandavas. Yudhishthira, the eldest brother, was crowned king. Falling prey to Duryodhan’s wicked plans, Yudhishthira played dice with him and lost his kingdom and went back to the forest with his brothers to live in exile for 13 years. At the end of the exile Yudhishthira legitimately asked for the return of his kingdom, but the selfish and greedy Duryodhana refused to relent. War became inevitable. Both sides wanted the help of Lord Krishna (a manifestation of God according to Hindus. 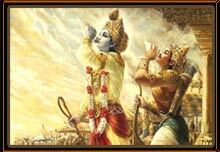 "Either you have my army or me alone; But I shall take no part in fighting," Krishna offered both the same choice. Duryodhana wanted to have the army but Arjuna chose Krishna, and asked him to be his personal charioteer. The battle was fought on the plane of Kurukshetra. Just before the commencement of the battle Arjuna had fallen into an illusion and refuses to fight against his own kin. Lord Krishna taught him the righteous nature of the Kurukshetra war and the need for him to fight the battle without hesitation. 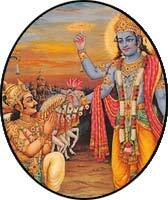 Arjuna heeded to Lord Krishna’s advices. The war lasted for only 18 days and the Pandavas won the battle. The contents of the bhagavat Gita is nothing but the conversation between Lord Krishna and Arjuna that took place on the battlefield before the start of the Kurukshetra War. Responding to Arjuna's confusion and moral dilemma about fighting his own cousins, Lord Krishna explains to Arjuna his duties as a warrior and prince, and elaborates on different Yogic and Vedantic philosophies. "Why do you worry without cause? Whom do you fear without reason? Who can kill you? The soul is neither born, nor does it die." "Whatever happened, happened for the good; whatever is happening, is happening for the good; whatever will happen, will also happen for the good only. You need not have any regrets for the past. You need not worry for the future." "What did you lose that you cry about? What did you bring with you, which you think you have lost? What did you produce, which you think got destroyed? You did not bring anything - whatever you have, you received from here. Whatever you have given, you have given only here. Whatever you took, you took from God. Whatever you gave, you gave to him. You came empty handed, you will leave empty handed. What is yours today, belonged to someone else yesterday, and will belong to someone else the day after tomorrow. You are mistakenly enjoying the thought that this is yours. It is this false happiness that is the cause of your sorrows." Teachings of Bhagavad Gita "Change is the law of the universe. What you think of as death, is indeed life. In one instance you can be a millionaire, and in the other instance you can be steeped in poverty. Yours and mine, big and small - erase these ideas from your mind. Then everything is yours and you belong to everyone." "This body is not yours, neither are you of the body. The body is made of fire, water, air, earth and ether, and will disappear into these elements. But the soul is permanent - so who are you?" "Dedicate your being to God. He is the one to be ultimately relied upon. Those who know of his support are forever free from fear, worry and sorrow." "Whatever you do, do it as a dedication to God. This will bring you the tremendous experience of joy and freedom of life forever." Albert Einstein: "When I read the Bhagavat Gita and reflect about how God created this universe everything else seems so superfluous." Aldous Huxley: "The Bhagavat Gita is the most systematic statement of spiritual evolution of endowing value to mankind. It is one of the most clear and comprehensive summaries of perennial philosophy ever revealed; hence its enduring value is subject not only to India but to all of humanity." Mahatma Gandhi: "When doubts haunt me, when disappointments stare me in the face, and I see not one ray of hope on the horizon, I turn to Bhagavad Gita and find a verse to comfort me; and I immediately begin to smile in the midst of overwhelming sorrow. Those who meditate on the Gita will derive fresh joy and new meanings from it every day." Henry David Thoreau: "In the morning I bathe my intellect in the stupendous and cosmogonal philosophy of the Bhagavad Gita, in comparison with which our modern world and its literature seem puny and trivial." Dr. Albert Schweitzer: "The Bhagavat Gita has a profound influence on the spirit of mankind by its devotion to God which is manifested by actions." Carl Jung: "The idea that man is like unto an inverted tree seems to have been current in by gone ages. The link with Vedic conceptions is provided by Plato in his Timaeus in which it states 'behold we are not an earthly but a heavenly plant.' This correlation can be discerned by what Krishna expresses in chapter 15 of Bhagavad-Gita." Herman Hesse: "The marvel of the Bhagavad Gita is its truly beautiful revelation of life's wisdom which enables philosophy to blossom into religion." Ralph Waldo Emerson: "I owed a magnificent day to the Bhagavat Gita. It was the first of books; it was as if an empire spoke to us, nothing small or unworthy, but large, serene, consistent, the voice of an old intelligence which in another age and climate had pondered and thus disposed of the same questions which exercise us." The Bhagavad Gita teaches us not to be despondent. By teaching Arjuna the wisdom of yoga, Bhagwan Krishna showed Arjuna how not to be despondent. Through meditation and yoga we learn how to take care of the inner conflicts and sorrows. Whenever we surrender to God, sincerely, with devotion and an open mind and heart, we receive the answers. In the Gita, Bhagwan Krishna tells us to fight the battle. There are 700 shlokas in the Gita and each one tells us how to become a Yogi in its true sense.